The "Saxon Tales" series provides an adventure-filled retelling of one of the most crucial conflicts in the history of the Western World. Of the many dramatic stories of raids, battles and conquests dotting the landscape of the Viking Age, none is more astonishing than the Danes' ninth-century assault on England and the hard-fought campaigns in which the sole surviving Anglo-Saxon kingdom eventually won back the lands the invaders had held for almost fifty years. Cornwell's gripping series begins with the Great Invasion, in which Danish armies utterly destroyed two of the four great English kingdoms and left a third, Mercia, as a dependent rump. They then pressed to the very brink of destruction the kingdom, Wessex, referred to in the first "Saxon Tales" title, The Last Kingdom. King Alfred the Great leads Wessex through a series of wars that rage through the first five novels. By the sixth, he lies on his death bed, and the first fights are about to begin in a new round of wars that will test whether his children can match, or even surpass, the accomplishments of their father. Cornwell's protagonist is the heir to a lost earldom in the north. Raised from an early age by the pagan invaders, he adopts their beliefs and learns their methods of combat, which he then employs in defense of the surviving Saxon kingdom. 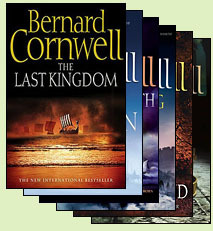 In other novels, Cornwell has carefully depicted the mechanics of battle in the ages of the longbow (the "Grail Quest" series and Agincourt) and Napoleon (the "Sharpe" series). In "The Saxon Tales" he brings his intelligence to bear on a vivid recreation of hand-to-hand battle in the shield wall. We can look forward to several more volumes tracing the story of this age to its logical end.